Karate has its roots in exercises developed centuries ago by unarmed monks travelling in India and China. Unarmed fighting arts of this sort came to Okinawa, where they underwent blending with Okinawan forms of self-defence and subsequent development. Finally, this martial art came to Japan where it underwent codification and fusion with certain aspects of Japanese culture and martial arts to become modern karate. As karate entered the Western world, an image of violent fighting crept into the popular presentation of this ancient skill. In actuality, traditional karate of the Japanese schools is a physical art steeped in cultural traditions, among which are courtesy, dignity, and detachment. These traits are still evident in the ‘modern’ traditionalist. Karate has been practised in Canada since at least mid-century. The early practitioners of karate eventually established an organization to continue the legitimate development of karate teaching. 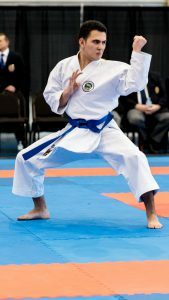 This organization became the National Karate Association of Canada . A number of instructors in Alberta also formed a governing association to help the development of traditional karate in this province. This was the start of the Karate Alberta Association.